Fall is finally here but the warm weather is fighting to stick around. For those warm days when cooking in the kitchen sounds awful, it's much easier to whip up something quick or at least on the grill. Today's recipe is a great weeknight dinner that is filling yet still light enough for warm days and it only has a handful of ingredients. I love berries in my salads. I'm not a winter salad person either so I have to binge on salads while it's still warm. Once it gets below 60 degrees I'm in the mood for soup. With these last few warm days, it's a great time to take advantage of all the produce that's either in season or at the end of it's season. Using a goat cheese for crumbles will give this dish a little extra tang. 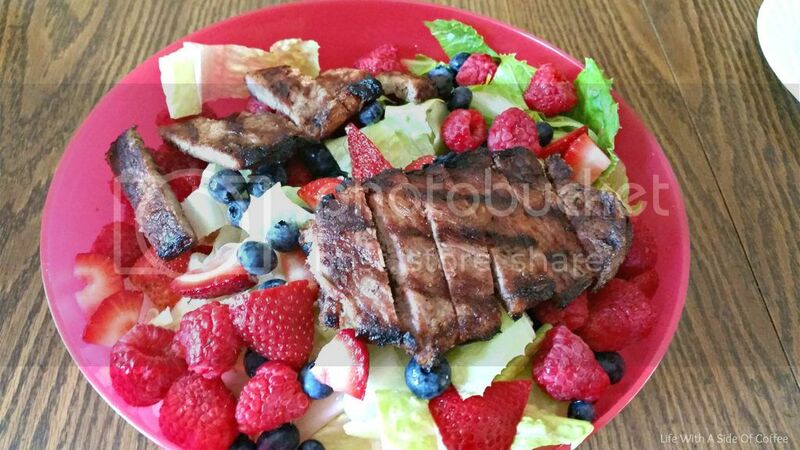 All it takes is grilling the steaks, throwing the veggies and fruit together, whipping up the dressing and sprinkling the cheese. Everyone should enjoy this and it kills all cravings: sweet, savory, cheese, tart and meat! Place the steaks on a heated grill and cook 3-5 minutes per side depending on the thickness of the cut. Take them off the grill and set aside to rest.Chop the Romaine lettuce and place into a large bowl. Add the fresh blueberries, raspberries and sliced strawberries. Set aside.In a small bowl, whisk together the olive oil, balsamic vinegar, salt and pepper to taste for the dressing. Slice the steak on an angle and lay on top of the salad. Sprinkle coat cheese crumbles through the salad. Serve with the balsamic dressing on the side.